In the coastal city of Hull, Yorkshire, England, (full name: Kingston upon Hull), the Hull+ revitalization initiative is a collaboration between the Hull City Council and the Environment Agency. It will see an investment of up to £5 million in environmental enhancements to the Dock Office Row area, as well as reducing flood risk to businesses, providing greater economic and job security in the area. Port of Hull. King George Dock. It will complement the £27.4 million Hull: Yorkshire’s Maritime City project, also being delivered by Hull City Council. A grant of £15 million from the Heritage Lottery Fund helped enable the project. The first phase of work will see the removal of silt from the dry dock area off Dock Office Row. 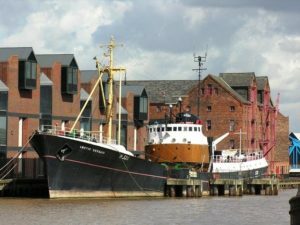 This will allow the Arctic Corsair to be relocated to the area after being renovated by contractors for Hull City Council. The Arctic Corsair is a deep-sea trawler that was converted to a museum ship in 1999. It’s currently berthed between Drypool Bridge and Myton Bridge in the River Hull, and is part of Hull’s Museums Quarter. The silt removed will be sent for recycling and used in the manufacture of building blocks. The Hull+ scheme compliments a number of other projects in the area which include the River Hull Defences, delivered by the Environment Agency, and the Hull: Yorkshire’s Maritime City project, delivered by Hull City Council. Featured image courtesy of Hull City Council. See Hull City Council website.